Do you remember the older days of the World Wide Web before Social Media sites became popular? During that time, there were personal homepages linked together into clubs of websites called “webrings”. The internet team ministry of dokimos.org, which I was webmaster for, started in 1996 and had grown for about 4 years and joined about 150 to 200 Christian webrings. 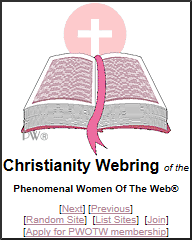 After this time, dokimos.org joined well over 500 Christian webrings. The final count was 588 before its close of webring ministry. The process of this, however, was not always smooth sailing. While doing massive outreaches of the gospel of Jesus Christ during this time, it was no surprise that the devil was going to try and stick up his ugly head in some nasty way somewhere. During the turn of the millenium in February of the year 2000, there were various webrings and many Christian webrings on the World Wide Web. Having many links was the way to website promotion for anyone. However, one Christian webring rose up of a new fashion that seem intended to “clean up the web”. While this sounds like a good idea, its methods stood to be questioned. The webring was called “Lily of the Valley” (LOTV) which started an aggressive campaign. If any Christian website in the Lily of the Valley Webring did not have links deemed by them as appropriate for Christian viewing, they were excluded from their ring. That is all fine and well since it was their own webring. However, they did take matters further. If any of their webring members had links to sites that linked to any other site that was deemed by them as “inappropriate” they would alert the ringmember site. If they did not remove the link at LOTV’s request, then emails would be sent. They did not only send messages to the members of their own webring but also to a whole number of other Christian websites about it. Thus, many other Christian websites would drop linking with the site. LOTV Webring leaders became the self-appointed “Christian Net-Police”. To take matters further, any site that LOTV dropped, being deemed inappropriate, would drop any other website in their webring that linked to the site they themselves dropped. They would email webmasters that were not even in their own LOTV webring if they didn’t like their links. 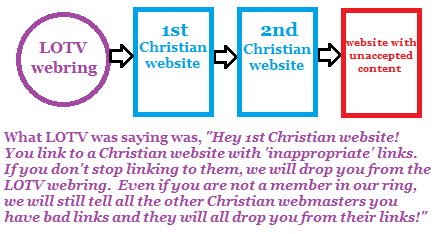 If they were not heeded then massive numbers of emails would be sent to many other Christian webmasters about it. This caused great embarrassment to anyone that LOTV did this to. Yet, I was amazed how rapidly so many webmasters initially went along with this. What this did was give respect to the LOTV Webring’s self-appointed authority over the content over the Internet of Christian websites. This went on and many Christian websites would cave into their demands or else face the consequences. Finally, LOTV came to dokimos.org which had a growingly vast number of banner links, text links, as well as members in webrings. Undoubtedly, they were going to find fault with dokimos. There had to be at least a few websites that dokimos linked to that had been deemed inappropriate links by them. LOTV criticized dokimos, too. However, we did not find proof of what they were saying that we were linking to sites that they disapproved of such as “lesbianism, wicca, paganism, astrology, etc.” The reply of dokimos was that we were not going to drop the links we had and that we did NOT like what they (LOTV) were doing. Subsequently, and more ferverently than others, LOTV criticized dokimos.org to many other Christian websites. The apparent cause for LOTV’s behavior toward us was that dokimos had joined a webring called “Christianity Webring of The Phenomenal Women Of The Web” (PWOTW). The webrings of this group did have a Christian webring, however, unfortunately for dokimos we found out later that they also ran webrings connected with “lesbianism, wicca, paganism, astrology, etc.”. When this matter was made clear, we immediately withdrew our membership from PWOTW and informed others. However, we did not withdraw membership because of being pressured or being blacklisted. We pulled out of their webring due to our own policies. The ministry of dokimos was willing to handle matters well without haste to jump to conclusions. Still, it was too late and much damage was done which resulted in much of cleaning up the mess. However, with all the massive emails going out by LOTV it brought on a mass hysteria. Please let me reiterate, that there was no inappropriate material on dokimos.org itself. What was being criticized was some of the links on dokimos where we did not see the problem, at least as yet. We were looking into the matter. The PWOTW issue was not as forthrightly clear until the issue was brought to light. From LOTV, there was also criticism was about the links on the links that dokimos linked to. We at dokimos did always try to keep clean links and actively sought this continually. If dokimos ever did unintentionally allow links to sites with “lesbianism, wicca, paganism, astrology, etc.” (How many times did we have to read this expression and get accused of it?) it was never our intent and such links that dokimos had were NOT direct links to such. It would have been better if such links could have been named specifically so the issue could have been addressed efficiently rather than being ordered to so or face wrath. It was not until later that we discovered, indeed, that dokimos was not guilty of linking to sites of “lesbianism, wicca, paganism, astrology, etc.” However, yes, it finally turned out there was a webring dokimos joined whose ringmaster also ran other such webrings. The link was described but not exactly pointed out where PWOTW linked to other improper websites. So what I was said like “O.K., now we see! Thank you for telling us.” after we had been so widely blasted publicly over it. Which, after the whole mess was over and we dropped the link with evidence finally shown clearly, instead of vaguely, we were told like, “Thank you! Have a nice day!” We already had enough to do on the web with the growingly extensive links dokimos was building. What happened was that a few individuals moved too fast and led away the crowd. Granted, dokimos joined so many Christian webrings that we did not take enough time to observe every link that websites had. My fault, my bad. However, the ministry of dokimos that stood in the gap and was on the hotseat on an issue which caused manipulation of a good number of others. I am personally thankful for those who decided to stand in the gap with dokimos when we stood strong on the matter so that the issue could be brought to light. Eventually the great majority stood with dokimos after the matter was so widely discussed. While the people who were rapid to respond to emails on the web handled matters quickly, it took others a while time to catch up on what was going on and rectify the issue. The dokimos website did get readded into Christian webrings but we needed to be patient and perseverant with this. The LOTV ringmistresses did come to their senses and did apologize at the end of this for which I was glad. They closed down their webring soon after. Yet quite a repair work from this had to be done with a number of web ministries. Many of the ringmasters that cast out dokimos received dokimos back into their indexes. The ministry of dokimos ended up standing up taller and stronger than before. We grew into a powerfully influential ministry with a dozen others coming to us to work together in partnership with us and thousands of Christian websites joining into our webring communities. If anyone feels like I pulled “a skeleton out of the closet” with this, please know that the team ministry of dokimos had to bear the hardest of it with me personally in that hot-seat. Christians can make mistakes in life like anyone else. The Christians did discuss this matter prayerfully and considered the issues when it came to light. By the end of this, Christians stood rightly on the matter. I praise God that, eventually, the great majority stood well with God on this matter with “Responsible Freedom of Speech” supported. In these days now, webrings have been long out of fashion on the web and, by far, most of the peoples’ websites that were involved herein have even been closed down. The crowd went to social networking instead. The ministry of dokimos.org stood for 18 years before recently completing its migration to MaverickChristians.com. The ministry of dokimos at MaverickChristians.com still goes on but times have changed and we do things now a bit differently. It was Bridget McCoy who originally referred to these events as “RING WAR” when she posted an article about this on her own website. I appreciate how she diligently searched out matters and brought matters to light when she did. My foremost appreciative thanks is to God who used Mark North (who was ringmaster of multiple Christian webrings). I also am thankful for the help of Elizabeth Ricard a.k.a. Heartseeker (who once was ringmistress of the Ring of Values). These were diligent heroes during this time as they stood for “Responsible Freedom of Speech” and watched out for the majority and consequently stood strongly with dokimos in its darkest hour.